I have a new love in my life and it is Blood Orange Liqueur. If you have never had blood orange liqueur you need to immediately! My brand of choice is Solerno. The flavor is mild and not overly sweet, and it tastes like fresh blood orange juice but with a distinct – and potent – kick. It also comes in a beautiful bottle, if such things matter to you. I can’t say enough nice things about it. We had it in more than a few cocktails over the holidays and I decided to try baking with it after my husband said how nice it would be in a dessert. I love the way his mind works! It also happened that I found some sweet, juicy blood oranges at my favorite market the very next day. It was as if fate had decided my next recipe would be blood orange flavored, and who am I to argue? 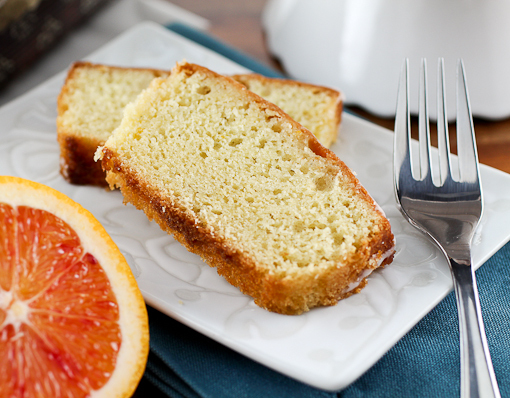 Pound cake is one of my favorite things to bake. 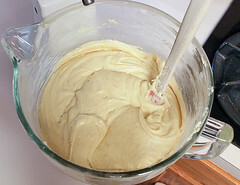 I love that the process of making the batter. I find it deeply satisfying to take a lump of butter and cream cheese, two ingredients that are fairly dense, and transforming them into a fluffy, lighter than air cake. This cake really improves with age. I recommend baking 5 smaller cakes, like I did, so you can have some the day it is baked and then some a day or two later. The flavor development is really astonishing. Taking a page from the rum cake, I drenched these little pound cakes with a blood orange liqueur, Texas whiskey, and butter syrup while they were still hot from the oven. Then, once cooled, I made a glaze with fresh blood orange juice. The glaze has a very pale pink color from the fresh blood orange juice that you could pump up with a drop of red food coloring. I didn’t feel it was necessary. I just wanted to eat it! 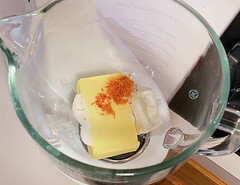 In the bowl of a stand mixer fitted with the paddle attachment, or in a large bowl with a hand mixer, add the butter, cream cheese, and orange zest. Beat on medium speed until the mixture is light and fluffy, about 5 minutes. Add the sugar and beat on medium-high speed for an additional 5 minutes. 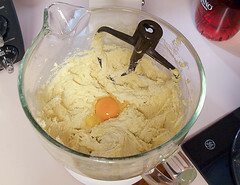 Add the eggs one at a time, beating for 1 minute at medium-high speed after each addition. Add the vanilla along with the final egg and beat for 2 minutes. In a small bowl combine the half and half and blood orange juice. Mix well. 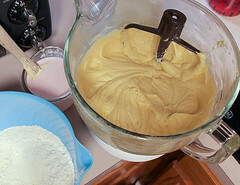 In a medium bowl sift together the flour, baking powder, baking soda, and salt. 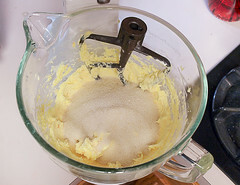 Add the sifted dry ingredients in three additions alternately with the half and half to the butter mixture starting and ending with the flour. Do not over-mix. 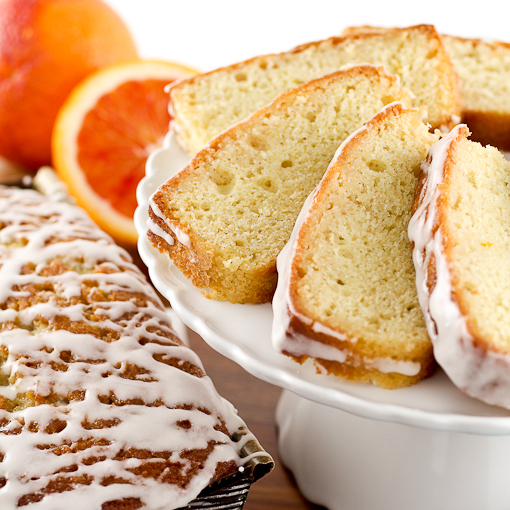 Scoop the batter into the prepared pans and bake for 35 to 45 minutes for small cakes, 55 to 65 for a large cake. The cake is ready when the center springs back when gently pressed and the cake starts to come away from the sides of the pan. While the cake bakes prepare the syrup. In a small sauce pan add all the ingredients for the syrup. Bring to a boil and cook for 1 minute. Allow to cool slightly. Once the cakes come out of the oven allow them to cool for 2 minutes, then take a long wooden skewer and poke holes over the entire cakes. 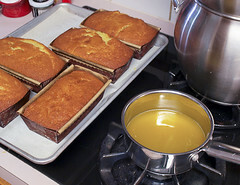 Pour the syrup evenly over the cakes and then allow them to cool to room temperature in the pans. While the cakes cool prepare the glaze. 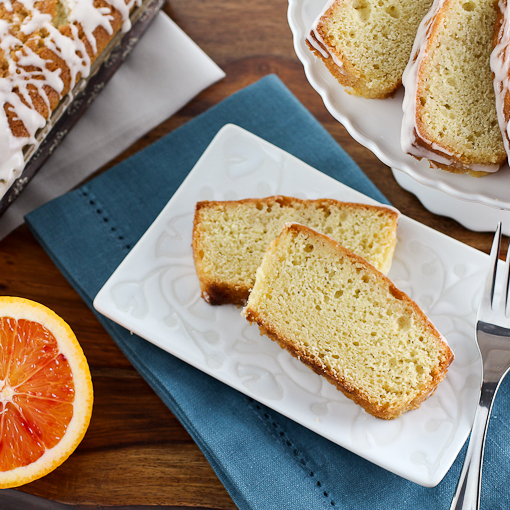 In a medium bowl combine all the ingredients for the glaze and whisk until smooth. 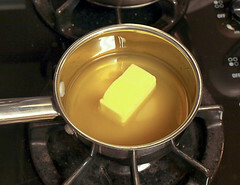 It should be thick but pourable and form a ribbon when a spoon is lifted from the mixture. Add more powdered sugar if it is too thin, more blood orange juice if it is too thick. 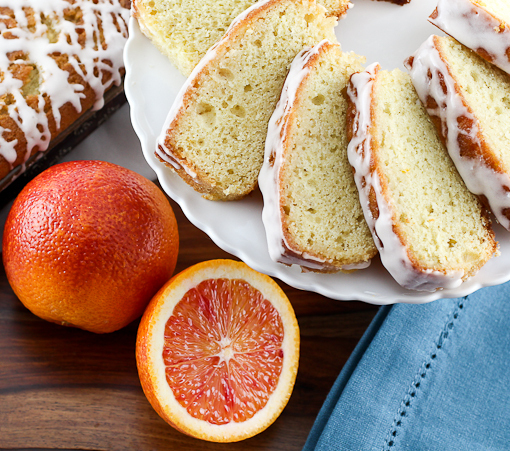 Once the cakes are cool drizzle the glaze over the cakes. Let the glaze set for 1 hour before serving. 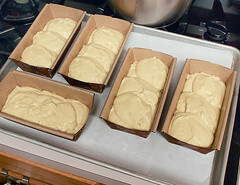 For longer storage put the cakes in an airtight container and refrigerate. 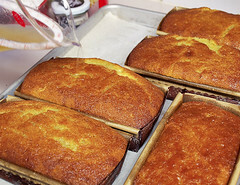 Allow the cakes to come to room temperature before serving. They will hold for up to 4 days. © 2013, Evil Shenanigans. All rights reserved.